Can you feel it? It’s creeping up on me – that sense that there’s never enough time, that the lists are too long, that the holiday hassles are homing in. On. Me. If you’re anything like me, you have high expectations of yourself in the holiday season. You’re crafty, you’re talented, you’re compassionate. You expect yourself to make, bake, and create the perfect gift for everyone on your list, to host the perfect cocktail/dinner/dessert party, to do it all within budget, on time, and while looking fabulous. Well, you do, don’t you? And that, my friend, is a recipe for anything BUT a healthy holiday. So, this year year, my goal is to slow down, let things go, and enjoy the simple moments – like hot chocolate with my kiddo. Because, really, aren’t the holidays really all about the ones you love? In a small saucepan, melt coconut oil over low heat. Add cocoa powder and agave. Stir until smooth. Slowly whisk in almond milk. Turn heat up to medium and whisk while heating until hot chocolate is smooth. Remove from heat and whisk in vanilla. Share with a loved one in your life. This post is part of the Gluten Free Holiday 2010 series – installment 1 – Staying Healthy Through the Holidays. Find more slightly indulgent recipes at Simply Sugar and Gluten Free – Slightly Indulgent Tuesday. This entry was posted in Blogger Community, chocolate, drinks. Bookmark the permalink. What a sweet picture! And I’m absolutely loving the look of this hot chocolate recipe. Wonder if I could raw-ify it and make WARM chocolate 😛 Seems like it’d work! Thank you! I think “warm chocolate” would work. All the ingredients are raw already – so why not! Almond milk really does make the best hot chocolate! 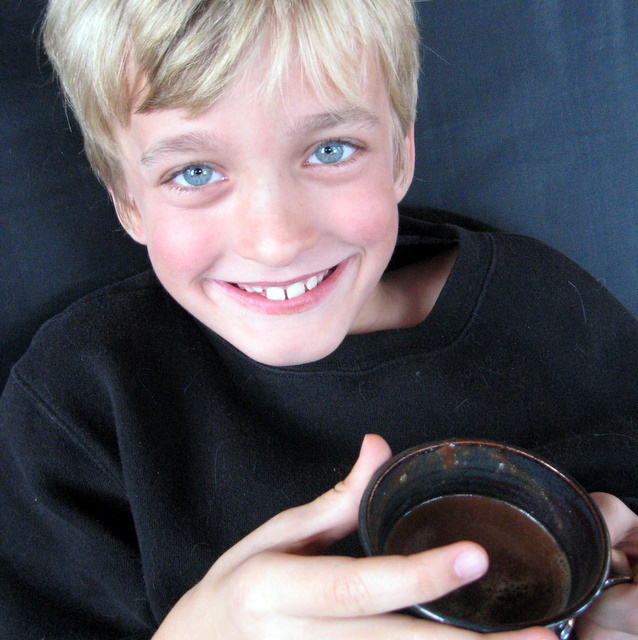 What a cutie with his hot chocolate! MMMMMMM,..Your home made hot chocolate looks amazing & so lovely!! Your son is a cuty! Look at those wonderful blue eyes! Definitely a recipe for a healthy holidays. This is delicious! My children thoroughly enjoyed it. Plus, it’s quick and easy to make.